The most eco-friendly choice you and your kids can make when it comes to Valentine’s Day is to design and create homemade Valentine's Day cards yourself using recycled materials you find around the house. Not only are DIY Valentines a good way to use up craft supply scraps, but it's more meaningful, fun and creative than simply buying a box of pre-made Valentines. That said, we do understand that family life can get busy. If your child needs a large amount of Valentines for classmates or you're throwing a Valentine's Day party, you may need to buy a box or two of Valentines and that's A-OK, as long as you go green. 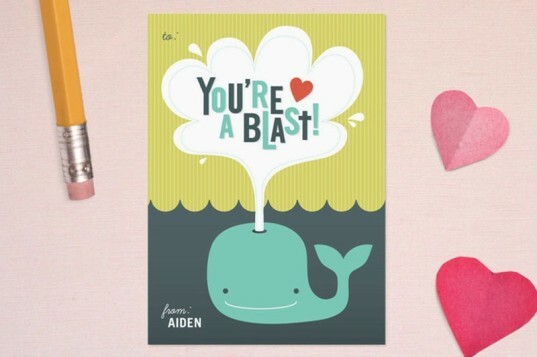 Following are some excellent eco-friendly Valentine's Day card choices that are fast, kid-friendly and green. Botanical PaperWorks is one of our favorite places to score eco-minded valentines. Not only do they carry adorable, sweet and beautiful design choices, but these Valentines give twice by being totally plantable. Your child’s friends can plant them in the ground come spring and see wonderful, colorful wildflowers pop up. Each valentine is printed on seed paper made using post-consumer materials, embedded with North American wildflower seeds. 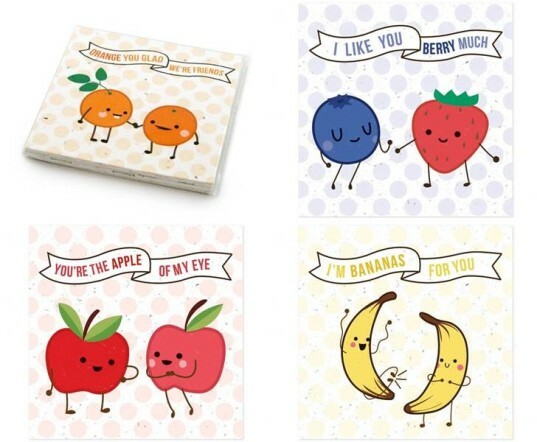 There’s plenty of fun Valentines to choose from at Botanical PaperWorks, but we can’t help but fall for the adorable Fruit Friends set. With cute fruit buddies and fruity-fresh puns your kids will love, this set is a clear winner for Valentine’s Day. Minted is a super stationary marketplace for independent designers and recycled paper. Their lovely classroom-friendly Valentine’s Day cards are fresh, modern and created exclusively for Minted by a talented community of independent designers. There are many fun and unique designs to choose from or you can customize Valentine’s Day Photo Cards with your favorite family photo and a personalized greeting. 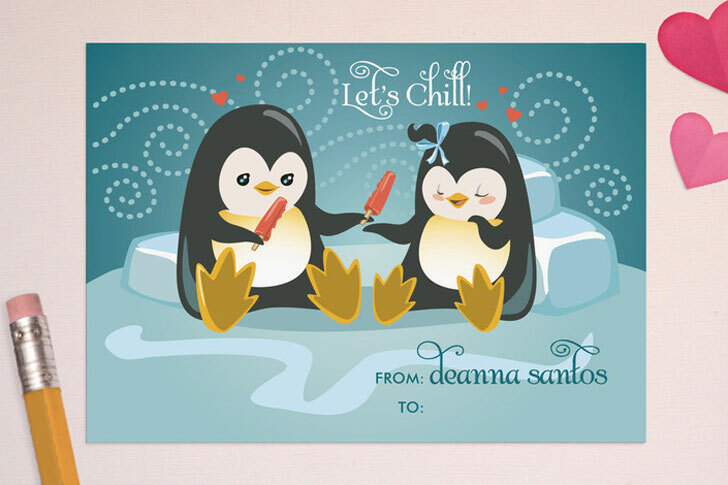 All of the Minted Valentine’s Day cards are available on 100% recycled Premium paper. Paper Culture takes green seriously by using only 100% post-consumer recycled paper and envelopes plus recycled packaging. They’re a CarbonFree® Partner and even plant a tree with every order and give customers the opportunity to dedicate the tree. Their line of Valentine’s Day Cards includes a wide range of photo Valentine’s Day cards as well as some with simple typography, so they’re better for classroom giving. If you’re looking for a sweet green Valentine’s Day deal, Pear Tree Greetings has got your back. They offer a wide array of adorable little 2 ½” x 3 ½” classroom Valentines that are too small to mail, but perfect for kids to hand out at school and insanely affordable to boot! All Valentines are made with premium, 100% recycled, 100 lb. matte-finish card stock (unless otherwise noted) and with so many designs to choose from, your child will find one to love for sure. 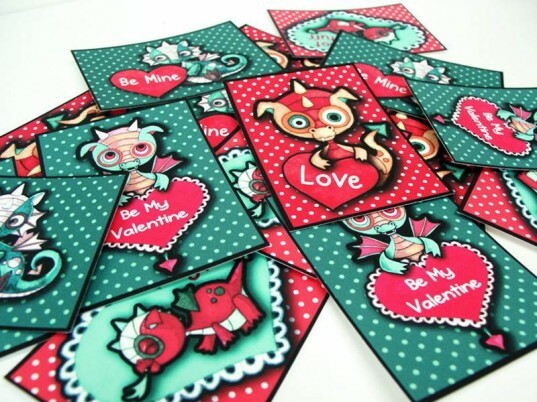 If you’re tired of the same old boring Valentine’s Day cards, try something unique this year, such as this beautifully designed set of 27, 100% post-consumer recycled paper classroom Valentines featuring four different baby dragons and hearts along with some sweet Valentine messages. These 100% original illustrations and designs really pop and will impress their recipients. Printed using fine archival pigment inks on 100% post-consumer recycled 62lb matte heavy stock from Red River Paper, these cards offer blank backs so your child can write a personal message to his friends. Botanical PaperWorks is one of our favorite places to score eco-minded Valentines. Not only do they carry adorable, sweet and beautiful design choices, but these Valentines give twice by being totally plantable. Your child's friends can plant them in the ground come spring and see wonderful, colorful wildflowers pop up. Each Valentine is printed on seed paper made using post-consumer materials, embedded with North American wildflower seeds. There's plenty of fun Valentines to choose from at Botanical PaperWorks, but we can't help but fall for the adorable Fruit Friends set. With cute fruit buddies and fruity-fresh puns your kids will love, this set is a clear winner for Valentine's Day. Minted is a super stationary marketplace for independent designers and recycled paper. Their lovely classroom-friendly Valentine's Day cards are fresh, modern and created exclusively for Minted by a talented community of independent designers. There are many fun and unique designs to choose from or you can customize Valentine's Day Photo Cards with your favorite family photo and a personalized greeting. All of the Minted Valentine's Day cards are available on 100% recycled Premium paper. Paper Culture takes green seriously by using only 100% post-consumer recycled paper and envelopes plus recycled packaging. They're a CarbonFree® Partner and even plant a tree with every order and give customers the opportunity to dedicate the tree. 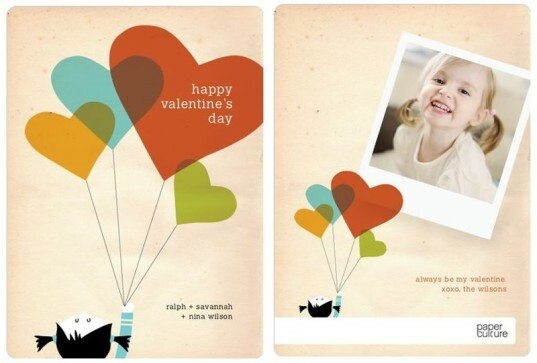 Their line of Valentine's Day Cards includes a wide range of photo Valentine's Day cards as well as some with simple typography, so they're better for classroom giving. If you're looking for a sweet green Valentine's Day deal, Pear Tree Greetings has got your back. They offer a wide array of adorable little 2 ½" x 3 ½" classroom Valentines that are too small to mail, but perfect for kids to hand out at school and insanely affordable to boot! All Valentines are made with premium, 100% recycled, 100 lb. matte-finish card stock (unless otherwise noted) and with so many designs to choose from, your child will find one to love for sure. If you're tired of the same old boring Valentine's Day cards, try something unique this year, such as this beautifully designed set of 27, 100% post-consumer recycled paper classroom Valentines featuring four different baby dragons and hearts along with some sweet Valentine messages. These 100% original illustrations and designs really pop and will impress the receiver. 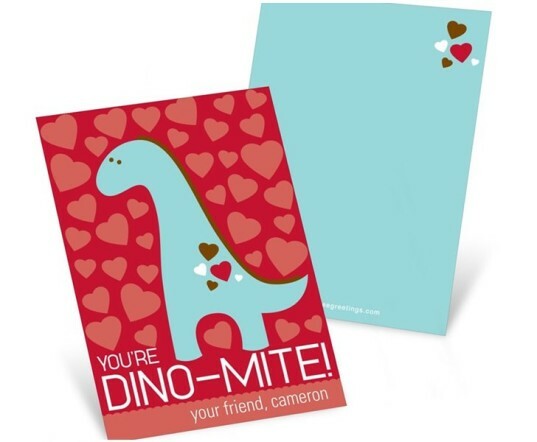 Printed using fine archival pigment inks on 100% post-consumer recycled 62lb matte heavy stock from Red River Paper, these cards offer blank backs so your child can write a personal message to his friends.